In case anyone is wondering what happened to 2015, life got in the way, and the bikes refused to behave until, at the very end of the year, we took the Cub down to Lydden. I had been trying to get there since 1974, so that was a result in itself. Lack of race practice during the year was all too evident, but the bike behaved itself so a pleasant and relaxed time was had. Over the winter the Daytona was finally persuaded to give up smoking - no nicotine patches were involved, but it took a great deal of perseverance. 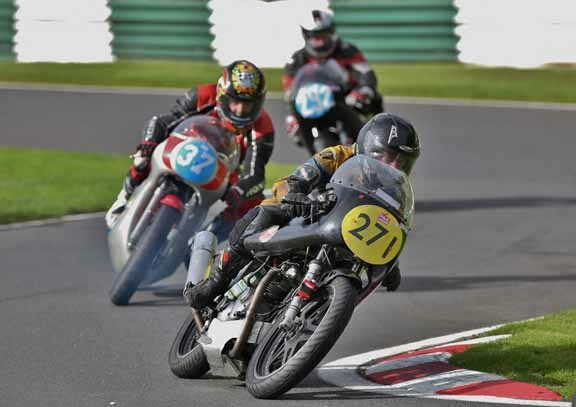 This opened up the possibility of entering the British Historic Racing BEARS (Britsh, European and American) class, the opposition therefore no longer being 1970s Japanese bikes, but instead 1980s Ducatis and Guzzis. The first meeting of the year was conveniently just down the road at Mallory Park. A circuit which neither Jenny nor I had ever visited, so a new experience to look forward to. We hired a van big enough for the Daytona, Cub and Jenny's Honda plus tools, spares and large tent – Sally and I had the tent leaving Jenny the van. We arrived on Friday in time to get the noise testing and scrutineering out of the way and had a fairly early night, encouraged to leave the entertainment tent by the very worst of 70's disco music. Having two bikes, I had two practice sessions, which gave me an advantage in learning the circuit, which has some fast and quite bumpy bits and an interesting selection of bends including a very tight hairpin leading onto the start/finish straight. 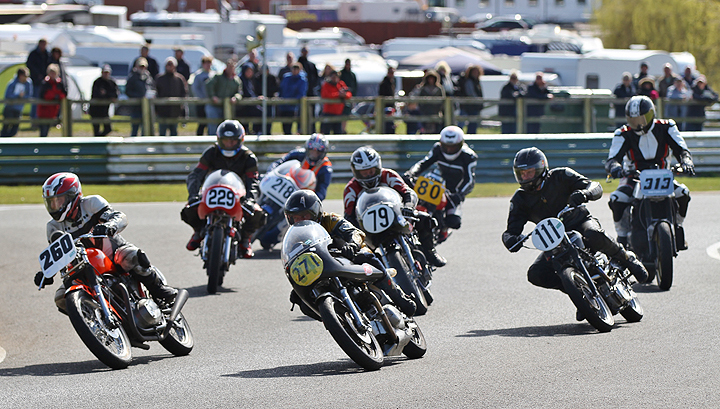 My races were back-to-back, the Cub immediately followed by the Daytona, which made for a rather frantic time with the need to have both bikes warmed up and a jump straight off one bike onto the other to make it to the grid in the nick of time for the second race. Most of my competitors in the 200cc four-stroke class were well ahead of me, but as usual I had some fun with a couple of less experienced riders on 250cc two-strokes; they had faster bikes but I could catch them in the corners. In the 500cc air-cooled Jenny and I battled for last place, most of the other bikes not in our class were 350 Yamahas, about half of them TZ's – MUCH faster. 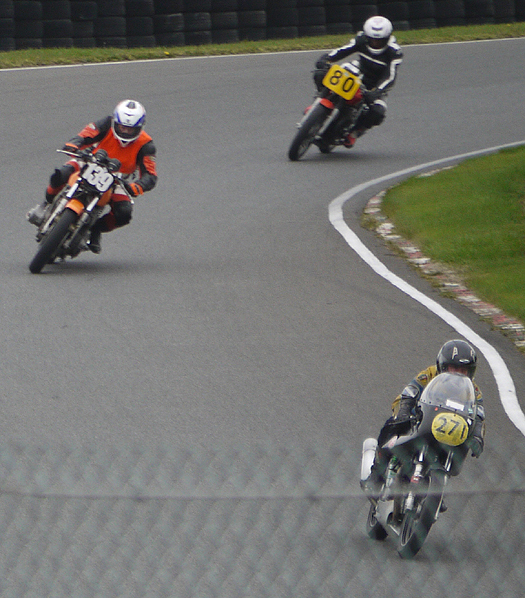 At least I reversed the situation at Mallory – this time I was slightly the faster of the two of us. In the second race later in the afternoon we both felt fairly comfortable but were disappointed to find that our lap times had not significantly improved. With rather cold and cheerless weather and a distinct lack of facilities at the circuit we looked set for a rather gloomy evening, but fortunately the DJ was of altogether of a different calibre, an old chap with a proper vinyl collection of weird and, at least some of the time, wonderful stuff. With the beer being half decent we got stuck in and had a good time, safe in the knowledge that noise restrictions meant that racing did not start until noon on Sunday. After all these years I bought a paddock stand! So, a lie in, followed by sunshine, warmth even, and time for a bit of light fettling on the bikes. 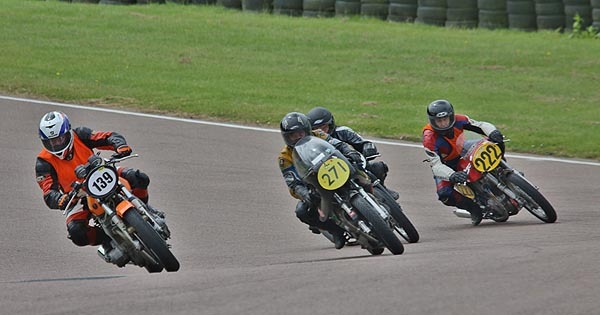 Come the races, I got got past a couple more bikes on the Cub with my best lap time improved by 7 seconds; I managed a 5 seconds improvement on the Daytona too, and got ahead of two of the Yams. Jenny's times had also improved, so we headed for home in good spirits. Inevitably, there is work to be done on both Triumphs, but they held together – hurrah! 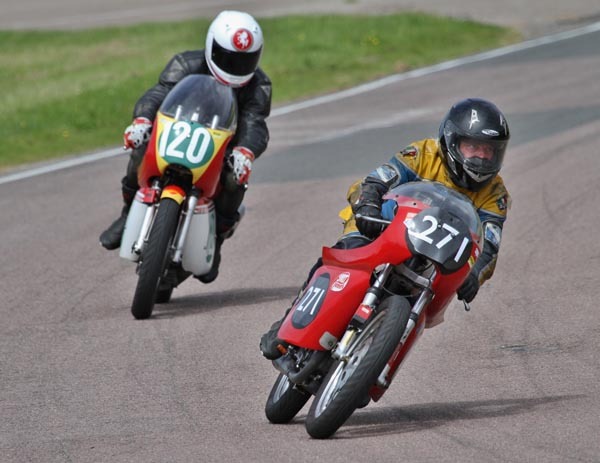 Into July, and another crack at Lydden, this time with both bikes. 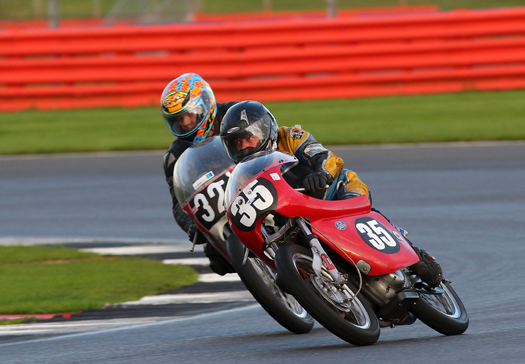 Having struggled to get going properly on the Cub there last year I had a theory that I would do better on the Daytona. The Cub kept ahead of some 250 Ducatis including this one, but was behind most of the Bantams. The practice session reminded me of why it had taken me a whole weekend to start to get the hang of the circuit – it has two blind bends where you can't just stuff it in and hope, my normal technique (if you can call it that). Fortunately I started to get the hang of it fairly quickly, but found that I was only three seconds faster on the bigger bike, and on both machines the limiting factor was the suspension. Torn leathers where a fellow rider lost the front end under braking and bounced off my hip. I needed to lose two seconds a lap to be competitive but attempts to go faster round the bends resulted in bouncing around and time lost instead of gained. It may be that playing around with the oil in the forks will help, or it may simply be that the very grippy tyres out-perfom the rather primitive damping systems. A front row start! 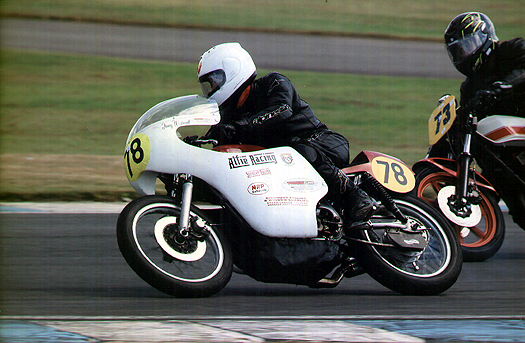 Nic Powell on his 750 Guzzi was getting second and third places, the chap on the orange 1000 Laverda Jota was still getting to grips with it. The 750 Norton Atlas on the right got by before long. And that pesky Jota did too - at previous meetings and in the first two races I have made up on the bends what I've lost on the straights, now my advantage in the twiddly bits is not quite enough. Interestingly, 222 has a yellow plate, indicating a 500cc bike, not a Norton Atlas. If so, he would be the only other entrant in the 500cc BEARS championship, which I may or may not be leading. What was needed to improve my race results was some rain, but having left my waterproofs behind the warm and often sunny weather was especially welcome. At last we had pleasant evenings to socialise in, with music and free beer in the scrutineering bay on Saturday night. 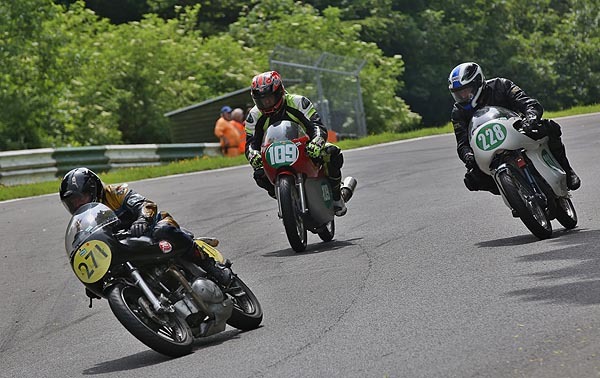 Having taken the Cub down at the invitation of the Bantam racers, as the two types of bike used to race together back in the day, it was good to talk to them; we also got to know the chap who was my nemesis at Cadwell, and the fast and friendly rider of a 750 Guzzi. With minimal work needed on the bikes we had a pretty relaxed and happy time...but the Cub started losing a bit of power in the last race so it is nose back to the grindstone in the workshop. 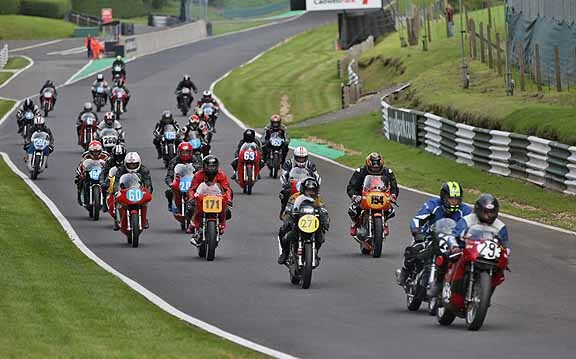 Cadwell Park at the end of June for something a bit different. 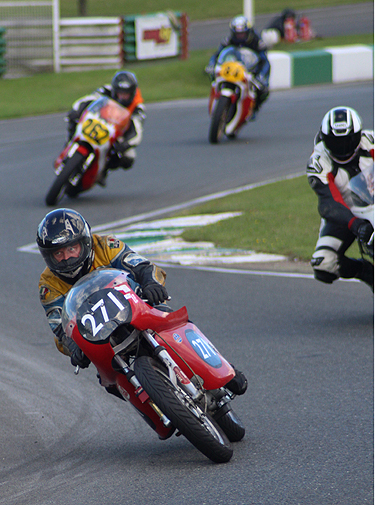 The Vintage Motorcycle Club were celebrating their 70th anniversary, and their racing section (British Historic Racing) its 50th. 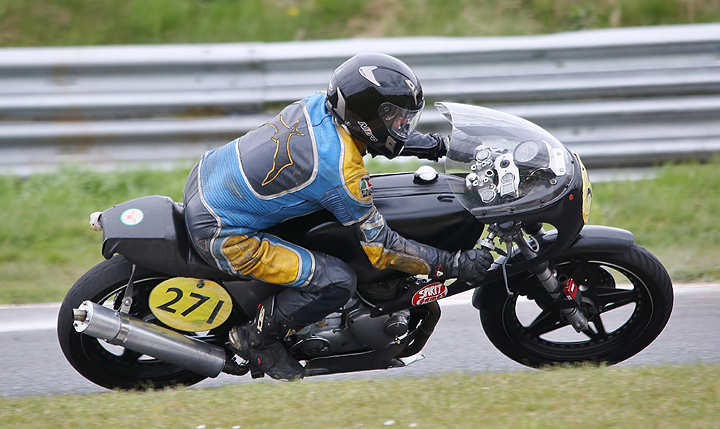 So on Friday there was a track day for road bikes, and Saturday and Sunday had a mixture of races and parades. Instead of the usual classes the races were split into four groups of mixed bikes, with a handicap race at the end for the top 9 scorers from each group. With around 26 in each group, I managed a 7th, 10th and 11th – eventually just one point short of qualifying for the main event. Still, it was fun. In road mode on Friday, with light and number plate still attached and no belly pan. A real eye-opener was the speed of the scooters, both on the straight and round the corners. They weren't like that on the streets of Croydon when I were a lad – yes, the Lambretta TV's and SX's were quick, but not coming close to 650 Triumphs and 750 Nortons, let alone beating them as the lap times revealed they would have done if put together (this weekend the scooters still had their own separate races). 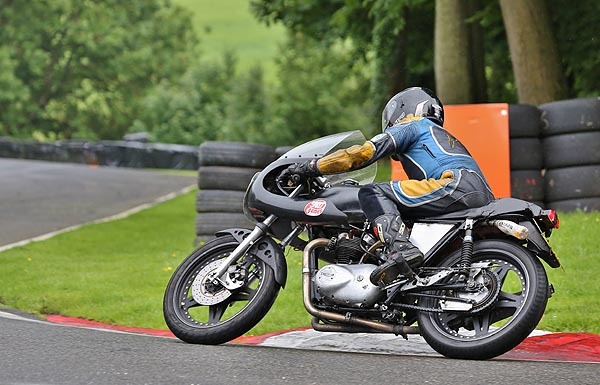 On the Friday I had the Daytona out in the road bike sessions – it is taxed and MOT'd as well as being used on the track – and as the event was under-supported it was opened up to racing machinery as well. This resulted in me dicing with a couple of scooters in a damp session; I had expected them, being lightweight 225cc two-strokes, to be on a par with the Daytona's 500cc four-stroke power. The next day's race results revealed that they were only mid-fielders in their class, the top scooters were MUCH faster. We live in an increasingly strange world. Keeping a 250 Ducati (109) at bay. 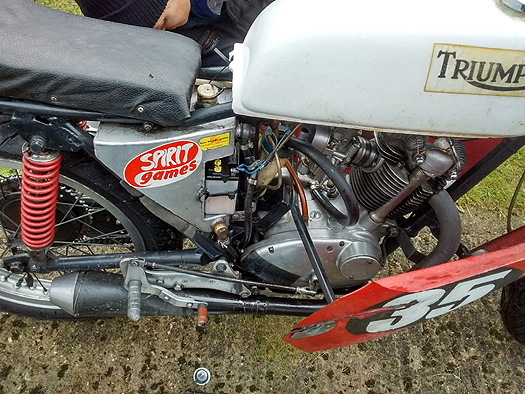 The other bike, a Greeves Silverstone, was quicker in two races but fell by the wayside in the third. Has the curse has been broken? 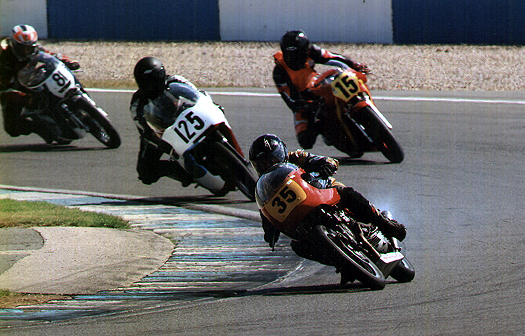 The last several trips to Donington have been disastrous; this time, although nothing great was achieved, a good time was had, despite some problems – and I was going faster than on previous occasions, which can't be bad. The meeting was spread over three days, with the option – which we took - of arriving a day early to get signing on and scrutineering out of the way so that we did not need to turn up to early on Friday. Donington being only a half-hour drive from home we enjoyed the luxury of our own beds, always a bonus. The Cub, Daytona and Jenny's Honda all behaved themselves in practice, in the single Friday race the Cub started to slow and I pulled in before the end, but the Daytona was going well enough. Jenny and I had the usual problem with faster straight-line bikes holding us up on the corners, I finished a couple of seconds ahead of her but she had a better fastest lap, so it was honours even. Come Saturday morning we arrived in time for the brief pre-race testing session, where I unveiled my new secret weapon, the ex-North Leicester Motorcycles Morini racer. This is barely faster than the Daytona, but, crucially, has an extra two gears, allowing me to get off the line better to pass the slowest riders on the first bend. I had never ridden it before so have yet to use its full potential, but moved up several places to do battle with a 500 Guzzi ridden with great gusto, not always keeping to the tarmac. He overtook me twice, I overtook him three times, to finish two seconds ahead – on the Sunday we repeated the fun, with me just pipping him to the post by a bike length. The new toy in action - 500 Morini beats 500 Guzzi (just) with a couple of 750s in the mix. I missed Saturday's race on the Cub but eventually tracked down its problem, and the sun was shining. 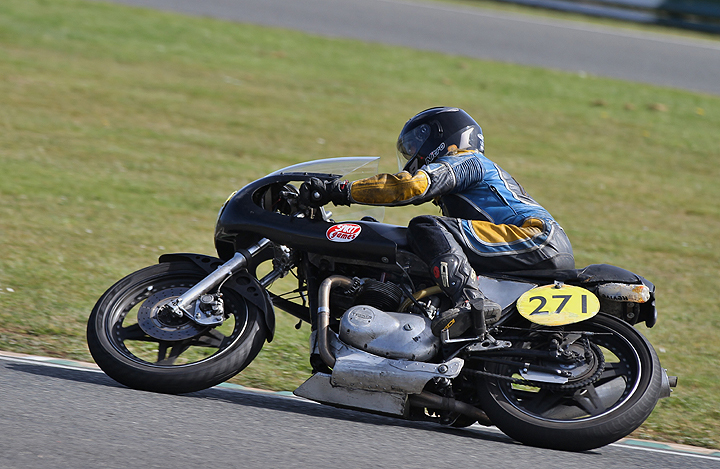 On Sunday I had an enjoyable ride but those Hondas are just too fast on such a track, and having got past an Aermacchi and Ducati that were clearly not at their best I had no-one to play with – but the sun was still shining! Alas, Jenny's Honda did not last the weekend, pouring out smoke and oil in a broken piston kind of way at the end of the second race. 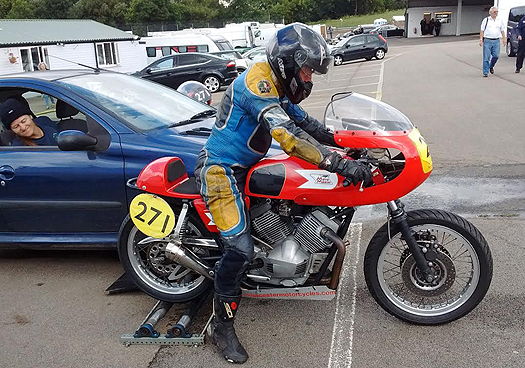 Our friend Chris Mayhew – a former very swift rider of my new Morini racer – was blindingly fast in his first race on his newly built Harris Kawasaki, until he fell off on the last lap while in a safe third position. With that bike also leaking a bit of oil, and with the cause of the crash as yet undetermined (the chain was broken but was that cause or effect? ), that was his weekend over. 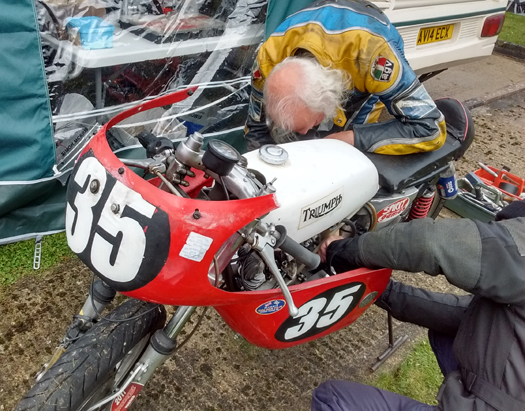 Fellow TR3OC member Chris Chapman maintained his championship lead on his 930cc Trident but his 750 version played up yet again – another piston gone. The weekend was... interesting. The days before were spent stripping the Daytona engine to check a few extra bits while replacing its knackered main bearing, new valve guides arrived in the post but time was running out and finally the lathe motor died so it was best just to go with the Morini to defend my lead in the BEARS championship. After all, I have just paid lots of money for it, what could possibly go wrong? What was achieved was the construction of the Mk I starter rollers, allowing us to start up the Morini in the garden to measure the noise; the last meeting was at Donington where there are no noise restrictions, but Mallory has to be quite strict. The reading was OK, which was a relief. Jenny came to help on Saturday, we loaded the rollers into the car and the Morini on the trailer and reached the circuit in time to get the bike and clothing scrutineered. Sally and I rolled out of bed in time to take the Cub down on Sunday morning. The weather on Friday had been decidedly iffy; we had only just dodged the worst of the downpours while loading and unloading bikes, so it was a relief to find Saturday looking pretty good. We had bagged a brilliant spot in the paddock, right outside the cafe, a stone's throw from scrutineering, and conveniently close to the pre-race assembly area. 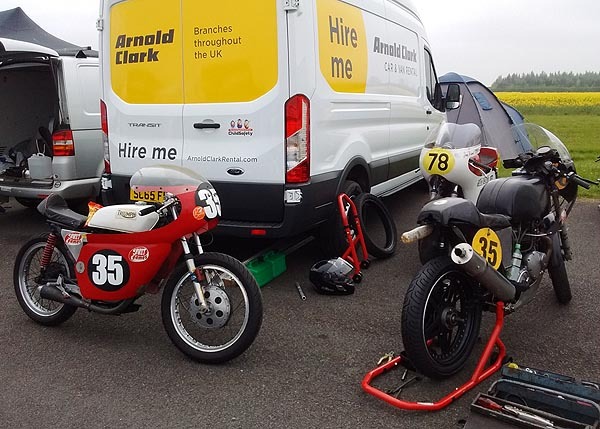 All went well with signing on, scrutineering, noise-testing and practice – the home-made rollers got the Morini fired up once more. The new rollers in action. 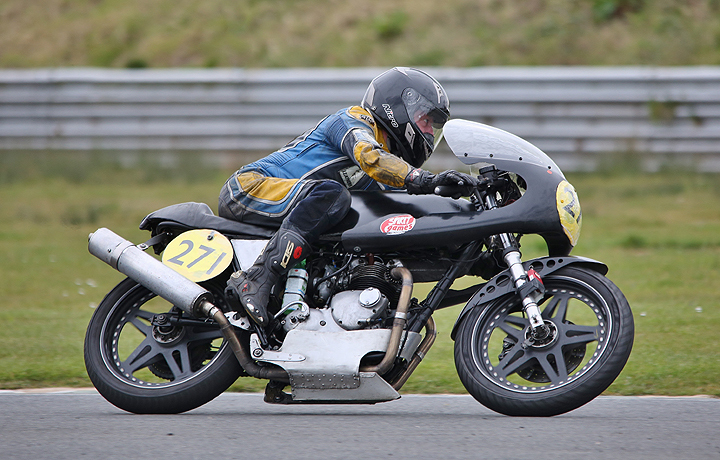 The races weren't especially exciting, with a group of bigger, faster bikes ahead of the Morini and the main opposition somewhere behind; the Cub struggled to keep up with most of the Bantams, as expected. But then, for the Cub's second race – hallelujah, some rain! Straight away I was closing up with a couple more bikes. But the Cub had been uncharacteristically hard to start, and a flickering tacho suggested an electrical problem, power delivery was erratic and I started to lose top speed down the straight, and fell back. Frustrated, I pulled in and started to investigate. I had changed to a fully-charged battery as a precaution, could the new battery be the problem? 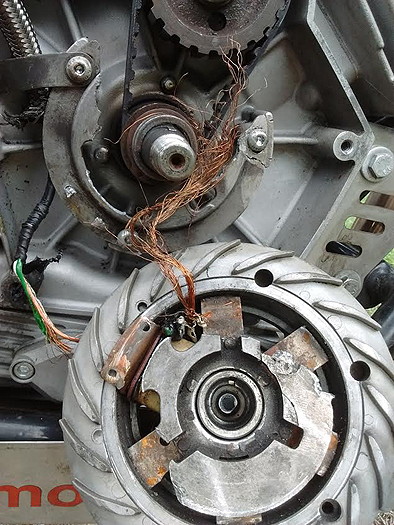 All connectors were checked, all seemed well; I tried putting the original battery back and the bike started up immediately. I took the good battery back to charge up overnight. 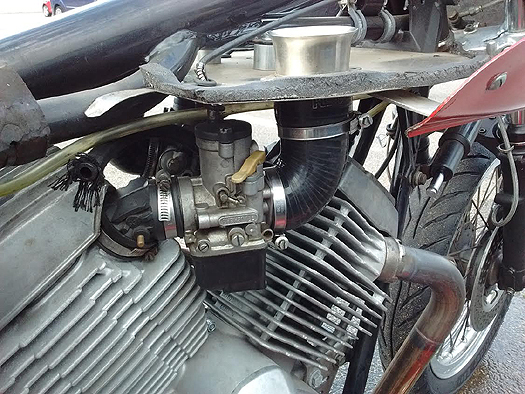 Meanwhile it was notice that an air intake was loose on the Morini, a bit of fettling looked likely to cure the cutting out at low revs that had been a problem. The tank had to come off to get at the air intake. Air trumpet back in position. It had been rattling around loose under the tank. Sunday dawned bright and clear – but the Cub electrics were still playing up. Oh well, it seemed to have nearly regained its top speed at least, and anyway, the main purpose of the weekend was to keep my lead in the 500cc BEARS Championship on the Morini. Shockingly, there were only two of us in the 500 class again, where have they all gone? Mallory is conveniently in the middle of England, easy to get to from all directions. 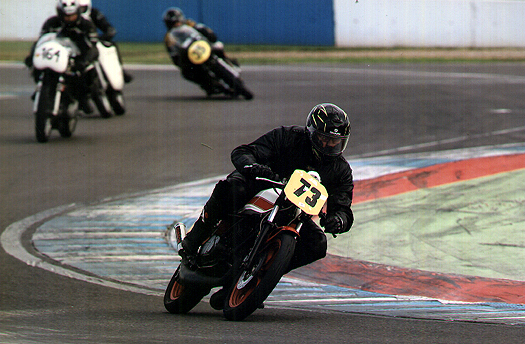 So while I was getting 25 points for a win, the chap on a Laverda Montjuic was getting 20 points for second. 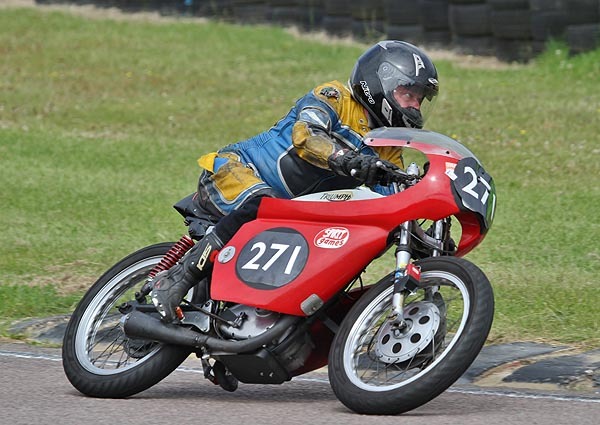 A couple of non-finishes and I would sacrifice my lead – and on the first lap of the first 500 race on Sunday, the Morini came to an abrupt halt. 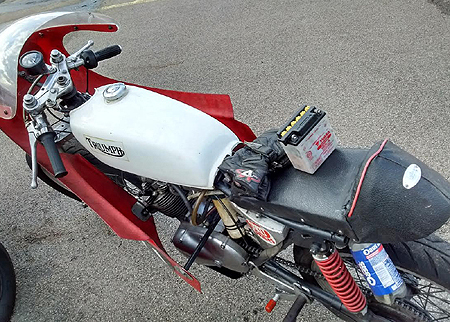 With the aid of a fellow Morini owner the problem was quickly revealed – the ignition system had disintegrated, bits of wire and broken mounting plate all over the place. Removing the cover revealed the carnage. 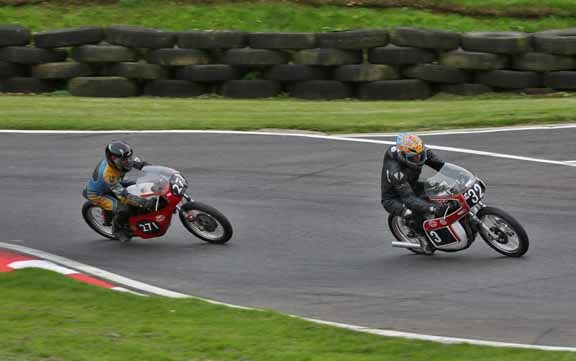 With one race still to go, there was only one course of action open, the 200cc Cub had to try to be a 500. This is not quite as silly at it sounds, the Cub's handling and braking is pretty good, and the lap time was only a second down on the Monjuic. If I could just gain that extra second – and a finish, at any rate, would yield 20 points for second place. The Cub out with its bigger cousins. 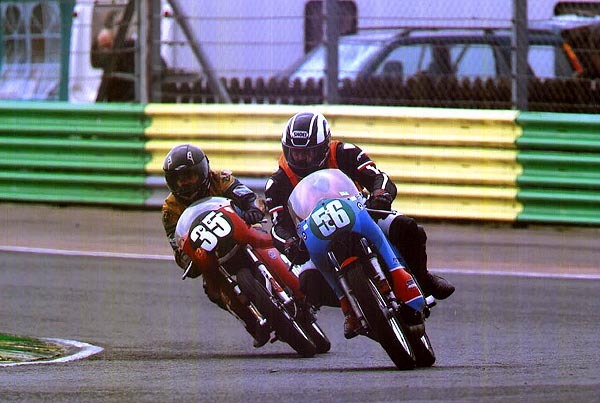 This was the meeting that would decide the BHR 500cc BEARS championship; I just had to finish ahead of Dave on the Laverda Montjuic and not break down or crash. 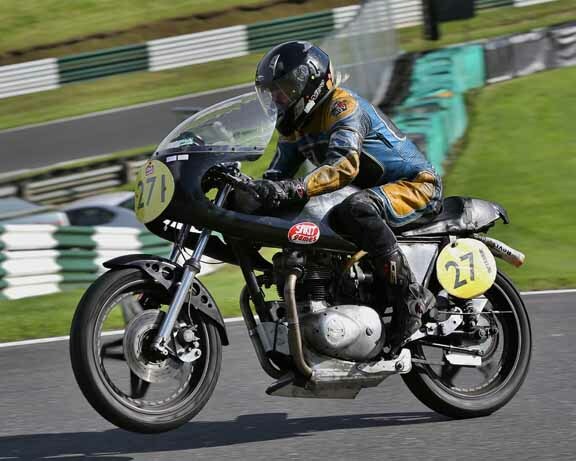 Although Dave had been taking lessons from former Superbike star Chris Walker and was now much faster than before round Mallory, he is not very familiar with Cadwell, whereas the Daytona has been round it so often it barely needs me to guide it. On the face of it, there should be no problem, especially as I had renewed the MOT on the Daytona so that I could take it out on the road to check the latest rebuild, and all seemed fine. On Friday night we had a thoroughly convivial evening in the clubhouse and on Saturday morning the scrutineering, noise testing and signing on all went smoothly. So, Race 1, the first of four that I needed to finish. After the warm-up lap we were held for some time on the starting grid, and were eventually sent back to the paddock as the doctor had been called away to attend an off-track medical emergency and racing could not start until his return: the bike felt a bit rough so I took the opportunity to check that the rotor had not come loose on the crankshaft – a 3 minute job. The securing nut was tight, but there was an extraordinary amount of end float on the crank, which was very hard to explain and a distinct worry. I decided to use the Cub again as a substitute bike, familiarity with the circuit would largely make up for the lack of power. Halfway round the second bend the track was suddenly full of bits of bike and bouncing bodies, four riders had collided, the race was stopped and there was clearly going to be a significant further delay. Back to the paddock once more, and I started pulling bits off the Daytona to investigate. Jenny then ran up to say that only some of us had been flagged off the track, and the rest were being held on it. I needed to get back to join them, there seemed to be no rush so I spent a couple more minutes checking bits out before returning to the track, to find that the race had been re-started moments earlier. It looked as though I had blown the championship through sheer stupidity. 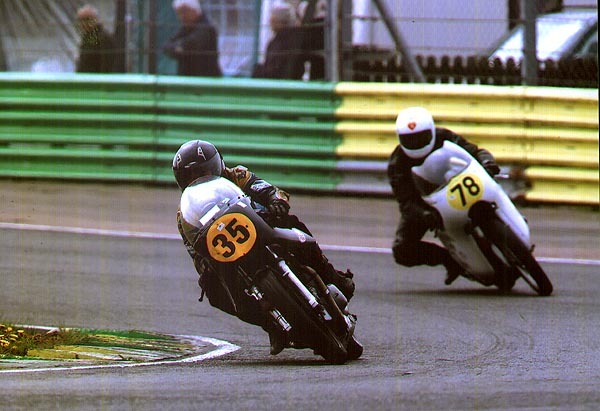 The Cub was out for its correct race shortly afterwards and from the lap times achieved then would have come second out of the four bikes in the 500cc BEARS race making the championship pretty secure. Getting the front airborne at the mountain is always a good sign. Over lunchtime I put the Daytona back together and concluded that while something was not right, it would most likely hold together and seemed to be going pretty well. I also realised that if I came first in the class in the remaining races and Dave came last I would more than make up for the lost points from Race 1. In the event, Race 2 was a lot of fun, with one of the bikes in my class being the energetic youngster whom I only just beat at Donington. I got my nose ahead at the last bend on the last lap, but in the drag to the line the clutch slipped just a bit, and he beat me by 2/100 of a second. Still, with me in second and Dave in fourth, I had made up 8 points and it was still game on. My best lap time was within a second of my fastest since the chicane was added a few years ago, which was pleasing. Being harried by pesky 350s. More conviviality on Saturday night, and the weather continuing to be eminently reasonable we also had several strolls around the paddock over the weekend to chat with the opposition and various people we had got to know earlier in the year. There were a lot of spectators, too – many more than at previous meetings – and as always people were pleased to see the Cub out. Racing against the Bantams it did not disgrace itself; it was never going to keep up with the really fast ones, but got ahead for three or four with some good duels on the way. Sally was marshalling on the Saturday and one overtaking manoeuvre involved going up over the kerb right in front of her, but as I stayed on she was not concerned. So, Sunday, and young Jordan on the Ducati got clean away as several of the bigger bikes got past me and then held me up on the bends, someone fell off and the race was stopped just over halfway so a result was declared. This time Dave had got ahead of the other Ducati to take third in class, I had only closed by 4 points but if my calculations were correct we would end dead level if we repeated the procedure in the final race. Getting off to a decent start. And then things went badly downhill. 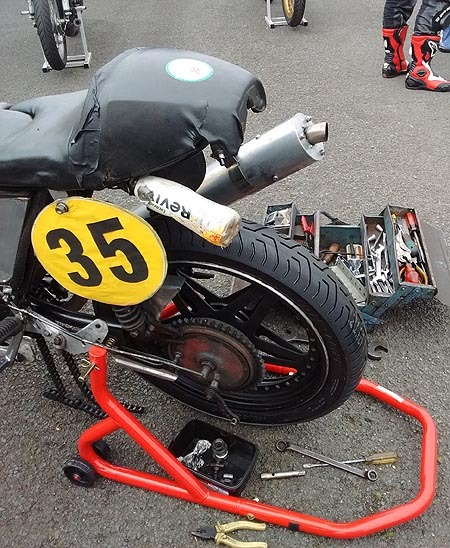 Just as I was going onto the track for the Cub's third race I felt something catching somewhere – a bolt had come loose on the rear sprocket and there was no time to sort it out so I had to pull out of a race I was looking forward to, the Cub was proving a particular pleasure to ride. Still, there was one more to go on the Cub, and before that two rides on the Daytona – just before the deciding final race, I was in an Over 50s race, a slightly strange concept since the average age of VMCC members is 64 and the racers are not much younger, I reckon that there were probably only two there who wouldn't have qualified. Still, it was a bit of extra fun, and on the last lap I was in 10th place and lining up for a pass at the hairpin for 9th when the red flag came out yet again. And this time tragedy had struck, the air ambulance arrived but to no avail; the meeting was abandoned. So the championship may have slipped away, but in the circumstances, it is of no importance. One meeting left, the CRMC Race of the Year at Silverstone in two weeks time, and a proper look at the Daytona needed. The Morini would have been ideal for the circuit, but it will be next year before that can (hopefully) be sorted out. The last meeting of the season. 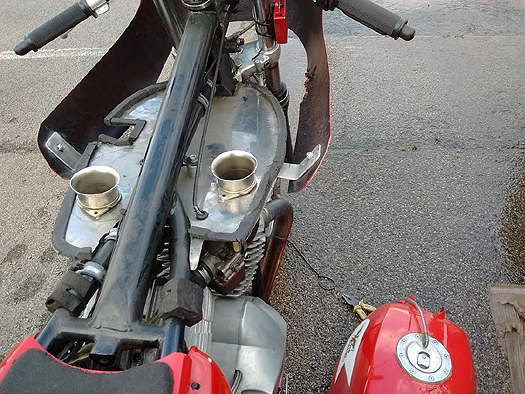 And so to the last race of the year, with the 500 Morini still very hors de combat, but with a reasonable hope that the Daytona would hold together, and the Cub was treated to a new primary chain as a precaution. Handily, Jenny had hired a van for the week, so we piled into that and arrived on Friday in time to grab an ideal patch where we could pitch the tent next to the van, and next door to Steve Jones on his Ducati Pantah, a fellow competitor in both the CRMC and the BHR. Noise testing, signing on and scrutineering all went smoothly, so there was no need to be up at silly o'clock on the Saturday. 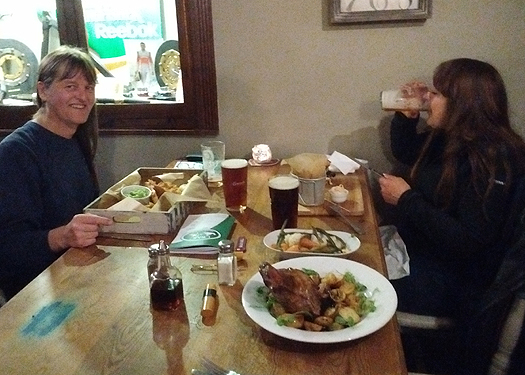 In the absence of beer and food of an evening at Silverstone, and also a lack of available cabs, we walked the 3 miles to a good pub, and in due course walked the three miles back again. Fitness training – taking the racing seriously. Half a sheep arrived after a large starter, it's a good thing there was a 3 mile walk back to the circuit. Practice went really well, with much scraping of boots on the bends, including the fast Copse bend where the forks juddered like a jack-hammer on the Cub but it could still be taken flat out on the smaller bike. First race was on the Cub – and it started raining. I have been waiting for a chance to fully test the grippy tyres it has, and on the first two laps found myself moving up steadily from a grid position at the back. On the third lap I decided that Copse could be taken flat out in the wet, which proved not to be the best plan, much sliding and a certain amount of rolling being involved. Surprisingly little damage, although a new screen was needed, of course. Fortunately the damage was minimal to bike, rider and leathers, and I got the obligatory medical check done in time for the Daytona's first race, to find that I and everyone else was sliding around all over the place. It was like an ice rink! I finished 14th out of 26 starters, so not too bad. 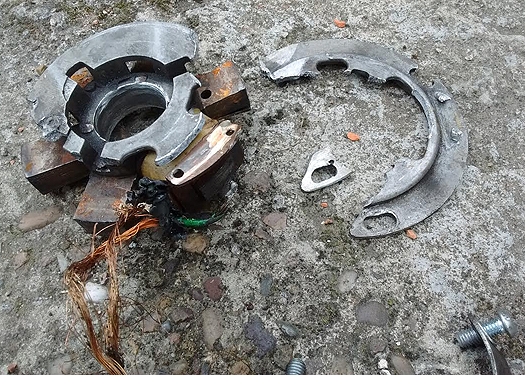 Heroic fairing bracket takes the brunt of the high speed fall. In the afternoon the weather was overall not bad, but was prone to showers and the track never really dried out. 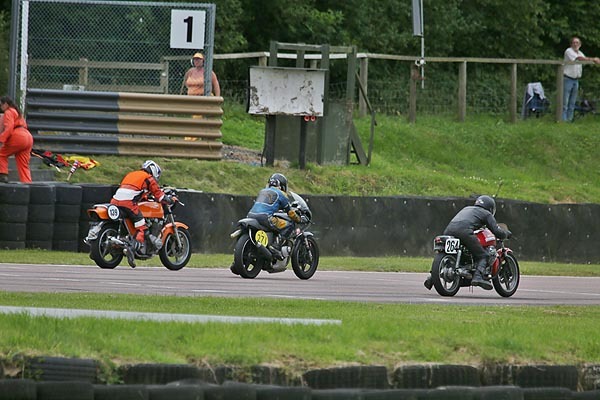 I stayed aboard the Cub this time and had a good dice with a 250 Honda, eventually finishing with four of my 200 4-stroke class ahead of me, but three behind, satisfactory considering that they are all faster on the straights. Then 14th again on the Daytona, chasing a whole gaggle of bikes – just a second per lap faster would have put me in 7th! More socialising in the paddock, then off to the same pub again, getting back quite late, but with a reasonably late start the next morning; with so many people falling off the races were running behind and there were a couple extra before the Cub's race. There was just one race for each bike on the Sunday, but they were due to be longer – the Classic Race of the Year, with a real podium for the top three to stand on. In the event people kept falling off on the first lap – the second time right in front of me at Maggot's bend – and the clerk of the course got fed up with restarting the race and postponed it to the end of the day – if there was time. In the Daytona's race I got off to a good start just as it started to rain again, and at Maggot's not one, but two people fell off in front of me. That'll be a red flag yet again, I thought, and eased up, to see about 8 riders immediately come past me. At the end of the straight another rider had already fallen off so the yellow "no overtaking" flag was out, and it stayed out for every bend as the rain fell harder. By the time I could get past the rider ahead the rest had disappeared into the distance, my visor was misting up, and with no-one to catch I didn't really care when two bikes came by. The end result was another 14th place; although I couldn't see them it turned out that the usual gaggle was not far ahead and had I not eased up 6th or 7th place could well have been mine. Oh well, c'est la vie. Slippery track - note the fallen rider in the background. So the question was, would there be time for the Cub's race – and the answer was yes. By that time the track was damp but with some dry patches. I settled into a rhythm of catching the two bikes ahead of me on the corners but one of them was my old foe the number 32 Bantam which accelerated like a rocket on the straights, coming past to hold me up on the damp bends where I still had a lot of confidence despite the faux pas at the beginning of the meeting. I would ride round him, but by keeping me off the optimum line he allowed the other bike to eventually get away. 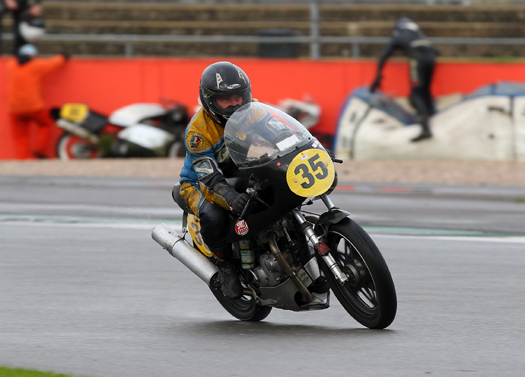 It transpired that said bike was in third place in my class – had I got ahead of him I would have repeated my 2010 feat of beating enough Hondas to have the Vintage Japanese Racing sponsor having to hand a trophy to a Triumph rider. Never the less, the race was a lot of fun, overall I rode much better than when last at Silverstone. A good end to the season. Ahead at this bend lap after lap, only to be out dragged to the line.